BRYAN EATON/Staff photo. 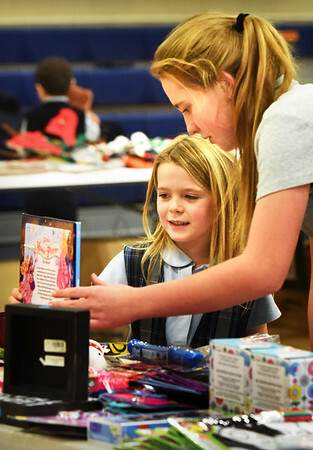 Newburyport's Immaculate Conception School is holding Christmas shopping days for students to buy gifts for family and friends with older students helping the younger ones to choose gifts and help them with their math in deciding what to purchase with the money they've been allotted. Shopping with first-grader Sophia Davis, 7, left, on Monday is eighth-grader Campbell Pearce, 13.